With his boyish good looks and gentle disposition, Clay has become one of the nation's most eligible bachelors. 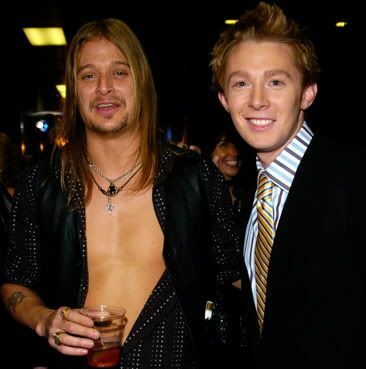 I love this picture of Clay and Kid Rock. They both look like a couple of good ol' boys having a great time at the AMA. Have you noticed that all the big celebrities have a genuine big smile when they are being photographed with Clay. Clay has this ability to make anyone he meets feel comfortable enough to smile big for the camera. I have no idea what magazine this is from. Thanks to idolforums.com for the scans! Carolina4clay-What picture are you referring to? I'd love to see it! I think that is so funny that Kid Rock said to Clay after winning--"I beat you, Clay!" He know Clay is a force to be reckoned with!! The Kid Rock and Clay photo is in the Photo Album on this site! Could you tell me under what post-in the Photo Album. I looked and I don't see anthing like Kid and Clay. Thanks! crazy4clay03! Where did you read that Kid Rock told Clay, "I beat you Clay!"? I'd love to see that article or the context of the quote! The picture is in the Clay at the AMAs thread. There is a download in the Member's Corner where Clay tells this story. It's a WRAL AMA video. Pamela, I'm sorry to take so long to reply I haven't went to this board since that post, and now I can't remember. I know I read it and thought it actually was a compliment to Clay!! I'll see if I can find it again. Sorry! OMG- disregard that last post- I see you already have you answer-- I am so out of it!!! Could someone please tell me what the latest hubbub is about a picture of Clay and another person. a picture that he supposedly didn't want published. I can not find out, I really believe the media is trying to destroy his fame, NOt in a million years, I say. Could someone find out about this picture and what it was about. Have you seen the latest Christian Music Planet Magazine? Clay's on the cover, has the main feature article and there is a review of his book! I get the subscription, but if you don't get the mag you can order a copy of just the Clay issue for $3.99. The demand was so high people were paying $50 on Ebay a weeek ago, so the people at CMP decided to sell individual copies through their website. Definately worth checking out. I love the "5 Things Clay Won'y Budge On!"